We were saddened to learn of the death of Britton Chance, a prominent biochemist and biophysicist best known for his important enzyme kinetics research. Chance, who was an old friend of Linus Pauling, not only enjoyed a very successful scientific career, but was also an Olympic gold medalist in sailing. He died at the University of Pennsylvania Hospital on November 16, 2010 at the age of 97. Chance was born on July 24, 1913 in Wilkes-Barr Pennsylvania. Sailing became an interest of his at a very young age, and this – when combined with his knack for inventing – led to his development, while still in his teens, of an automatic steering-correction device for ships. He earned his Bachelor of Science degree in physical chemistry from the University of Pennsylvania in 1935, and followed that with a Master’s degree and Ph.D. from the same institution in the same subject. In 1942, after spending time at the University of Cambridge in England, Chance earned a second doctorate, this time in physiology and biology. Although he stayed in Pennsylvania for the majority of his career, Chance also spent a couple of years in Stockholm, Sweden as a Guggenheim Fellow after the end of World War II. Chance became a member of the University of Pennsylvania faculty in 1941 when he was hired as Assistant Professor of Biophysics and Physical Biochemistry at the School of Medicine. From there he worked his way through the ranks, eventually attaining promotion to full professor. He remained in this position until his retirement in 1983, after which he was named Emeritus Professor. He took this role very seriously, and continued to be active in the university. During his graduate years, Chance developed a micro-flow version of the stop-flow apparatus, which is used to measure chemical reactions that involve enzymes. This invention later led to his enzyme-substrate complex principle, which posits that when an enzyme is used to catalyze a reaction, it temporarily associates with its substrate to form a complex. Chance called this the “enzyme-substrate complex,” a term which gave rise to the names of his two sailing yachts – Complex I and Complex II. 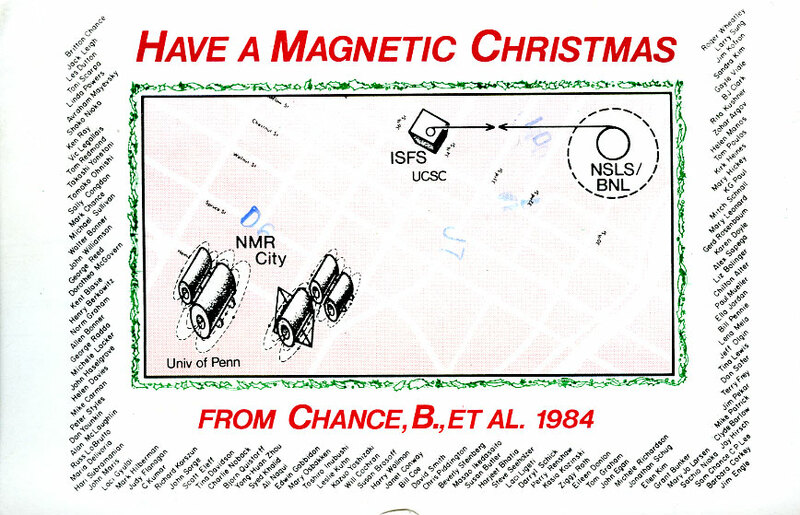 Christmas card sent from Britton Chance to Linus Pauling, 1984. Although enzyme research was Chance’s main focus for much of his career, he also worked with magnetic resonance spectroscopy and near-infrared optics with an eye toward developing techniques for analyzing muscle dynamics, detecting breast cancer and assessing cognitive function. Aside from the sciences, Chance’s interest – and aptitude – in sailing earned him a place on the 1952 U.S. Olympic Yacht Team, which won a gold medal at the summer games in Helsinki, Finland. He was married three times, and was father to eleven children and five stepchildren. Chance’s work earned him many honorary degrees from various institutions, among them the University of Düsseldorf, the University of Buenos Aires, the University of Copenhagen, and the Medical College of Ohio at Toledo. 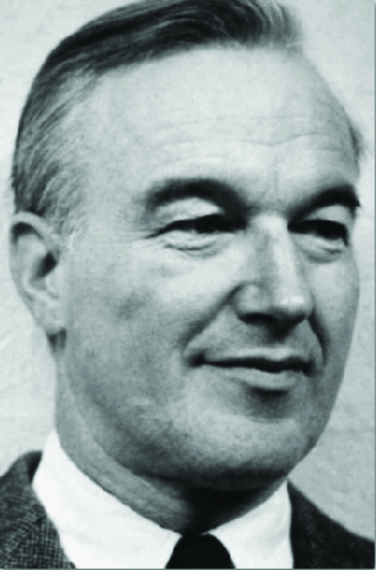 He also received numerous awards, including the John Price Wetherill Medal in 1996, the Gold Medal for Distinguished Service to Medicine in 1987, and, most notably, the National Medal of Science in 1974. The Britton Chance Papers were donated to the University of Pennsylvania Archives in 1999. In them, it is likely that one would find a comprehensive collection of Chance’s side of his correspondence with Linus Pauling, which ran from at least 1947 until 1993. Based on the letters held in the Pauling Papers, it is not completely clear when the two men became acquainted, but the evolution of their friendship can be easily observed. In their writings over the years, the two men discuss many scientific topics relating to their research, and several letters are dedicated to more personal topics such as family, travel plans, and visits to one another. It is clear that each man not only greatly respected the other, but also considered him a good friend.